Who’s afraid of Mr. T? 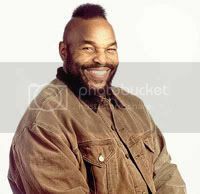 Apparently, coma is afraid of Mr. T.
Former The A-Team star Mr. T once stunned a sick child’s family by bringing him out of a coma – after doctors begged the actor for help. And when the mohawked star was in town, he stopped by the hospital to visit the ill boy – with miraculous results. He tells Empire magazine, “His family put toys around him and one of them was a Mr. T doll. And whenever my name came up, the boy moved his arm. “Somebody told the doctors I was in town, so they called me down there. I closed the curtains and prayed. Then, as I was walking down the hall, the kid suddenly came out of the coma and hollered out. It must be the mohawk. And all that bling-bling. I’m hoping you can join. No requirements, just a passion for blogging. But it will be a bit focused. Mostly on politics, social concerns, government, human rights, and civil rights. I’m hoping two weeks from now, we will be able to launch. The goal is to have around 5 to 10 passionate bloggers on board by then. Please email me or drop by tingog.com to inform me if you are interested.